NOTTS SOS Newsletter No. 3 – February 2011 – out now! More stories/photos: Valentine’s day ‘we love our services’ card event, various news links including Mansfield demo on 12th Feb, plus anti-cuts events on the 5th & 6th Feb. Yesterday, Saturday 5th February, as part of a countrywide protest against library closures ‘Voices for the Library’, library read-ins and other protests were taking place in Beeston, Carlton, Chilwell, Stapleford, Sneinton and Toton. In London at New Cross one library was occupied last night. Read more in Evening Post prior to Nottingham and Notts library events. 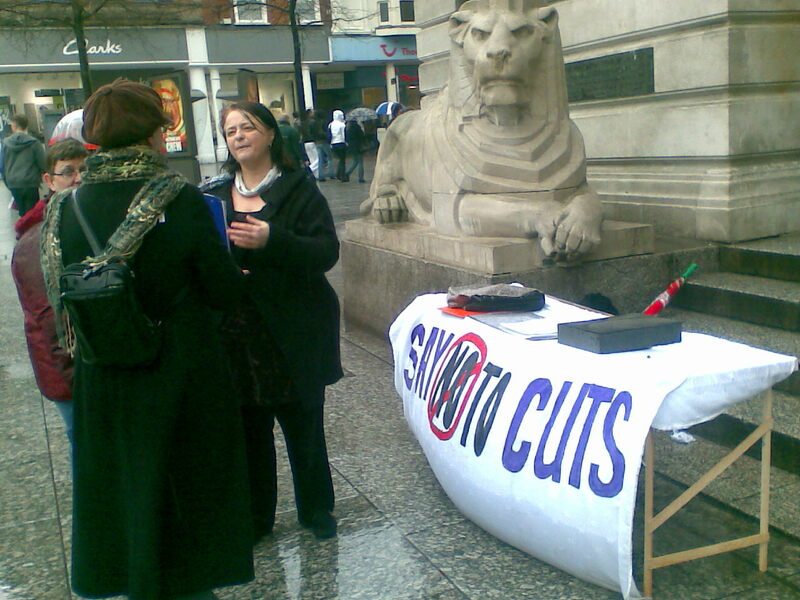 Also on the same day in the Market Square, Nottingham, a ‘Say No To Cuts’ stall was run by some of those involved with local homeless shelters and women’s refuges that are facing huge cuts or closure, also highlighting cuts to Refugee Action and housing support for vulnerable young people and adults. 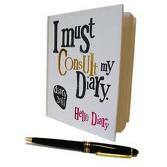 Leaflets and petitions were used to encourage more people to get involved. A set of letters written by local homeless teenagers was on display, explaining the vital importance to them of the housing and shelter facilities in Notts that are threatened by funding cuts. Campaign organisers described the cuts as ‘disgusting’ and vowed to prevent a return to large numbers of people sleeping in city centre doorways. 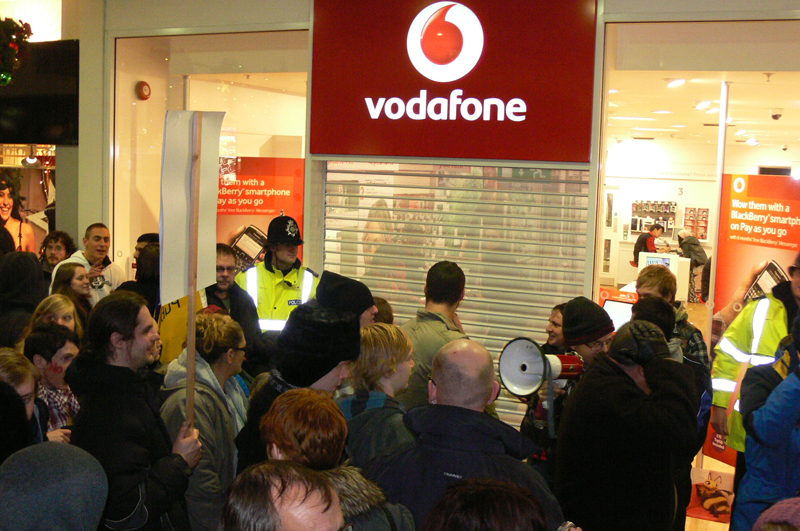 On Sunday 7th February 2011 at 1pm a UKUncut protest is due to take place at the Vodafone store on Clumber Street. Vodafone was let off billions off its tax bill by HM Revenue and Customs, money which could have been used to avoid public sector cuts. This is also the next local demonstration since one week ago it became clear that police had used CS spray and hospitalised UKUncut activists at the Oxford Road, London branch of Boots (who are another subject of this ongoing campaign against corporate tax avoidance). Today’s UKUncut protest in Nottingham makes a further link with the situation in Egypt where revolutionaries are being subjected to CS gas and worse. According to the Financial Times, both France Telecom and Vodafone transmitted pro-government text messages and “Some texts on Vodafone’s network appeared to urge Mr Mubarak’s supporters to confront the anti-government protesters.” According to Mark Steel, writing on Egypt in the Independent newspaper last week, “The Big Society taking place in Egypt means for a moment that the place has become the most democratic country on the planet.” UK UNCUT will therefore be highlighting demands that Vodafone pay their taxes and that they do not support dictators. See also: Report from a previous UKUncut protest in Nottingham, 30th Jan 2011. Saturday February 5th 2011 is marked as a national day of action against cuts and closures of libraries. ‘Read-in’ events on the day in Nottingham City and Nottinghamshire County so far include Beeston, Sneinton and Stapleford. Do let Notts SOS know if there are others. In Nottingham, the Council is introducing charges for using library computers starting on Monday January 31 (today). They are reducing the book fund by one quarter – this means many new books won’t be bought. They are changing opening hours. Central Library opening hours have already been reduced- there will be more reductions. They are closing Carlton Road Library. Update – a great support message sent to Notts SOS: Friends of Somerset’s Libraries video “with best wishes from all of us on the WeLoveLibraries production team”. Under the proposals, Beeston Library’s opening hours would be cut from 57 hours a week to 52, while at Inham Nook Library in Chilwell the opening hours would be cut from 20 hours to eight. 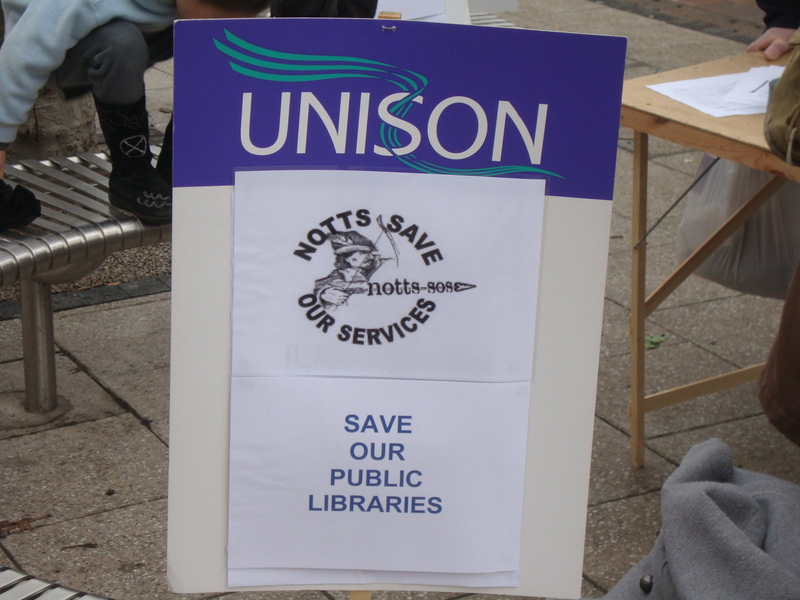 See Beeston and Chilwell Defend Library Services group: https://nottssos.org.uk/2011/01/23/protest-grows-against-library-cuts-beeston-chilwell-campaign-report-and-future-events/. Read-in starts 11am on Saturday 5th February at Beeston Library. Sneinton Against The Cuts are organising a Read-In at Sneinton Library, Sneinton Boulevard. This is part of a national Read-In to defend library services and coincides with the Nottingham City Council’s decision to begin charging for using Library computers. We have also made a petition against the introduction of Library Computer Charges and a template complaints letter because there has been no consultation or notice given for the introduction of charges – Let us know if you want these. We are going to do an article about the impact of computer charges. At Stapleford library they will be having a ‘read-out’ – Day of action against the library cuts – February 5th. Kick off 11am. About four of us will be reading from books with possibly some storytelling too. One of the readers says he “will be personally reading ‘I wandered lonely as a cloud’ minus 50%”. City Libraries – Blast from the past: Library Staff Speak Out Against Uniforms and Management Bullying 12/03/2008. Opposition to cuts to library services is growing after more than 100 people attended a public meeting in Beeston. Protesters will gather at 11am on Saturday 5th February at Beeston Library to oppose Conservative-run Nottinghamshire County Council’s plans to reduce opening hours and to slash the new book fund by 75%. Under the proposals, Beeston Library’s opening hours would be cut from 57 hours a week to 52, while at Inham Nook Library in Chilwell the opening hours would be cut from 20 hours to eight. Public opposition to these plans is escalating. 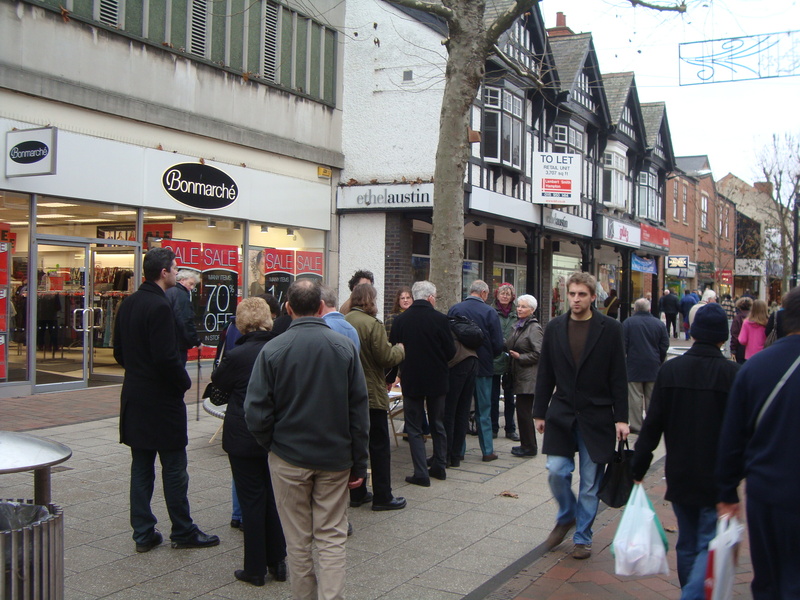 On Saturday 15th January more than 500 people signed a petition against the cuts during just two hours of leafleting in Beeston town centre. More than 100 people attended a public meeting organised by the newly-formed Beeston and Chilwell Defend Library Services group (part of the wider Notts Save Our Services campaign) at College House Junior School on Thursday 20th January. Fight for Nottingham City libraries facing service, books and staff cuts. We already know about cuts to County Libraries – redundancies, 75% cut in book budget, etc. Protests are organised (Beeston & Chilwell Defend Library Services campaign launched – public meeting 20th January and stalls on 15th & 16th). Recently, some news has emerged about cuts to City Libraries, which are managed separately from those in the County. Library managers and others of similar rank were called to meetings soon after the New Year, to be told the news. Opening hours across nearly all City libraries (excluding the main library at Angel Row) are to be cut by 10%, with a consequent reduction in staff. Management claims that there will be no actual redundancies amongst library assistants (the lowest paid), but that unfilled vacancies, voluntary early retirement and reductions in hours (voluntary??) will fill the gap. However, there will be redundancies amongst librarians, senior library managers and library managers, who have received “At Risk” letters. Currently, nearly all libraries have a manager, one grade up from a library assistant and theoretically responsible for the day-to-day running of the library; in future, library managers will be managing more than one library. Libraries already operating part time hours will be open even shorter times, leading to the possibility of borrowers never finding them open and giving up on using them; then there will be “no public demand” for those libraries. There will be no cuts at senior management level. Perhaps this is because nobody knows what they do. The City book budget will be cut by 25%. As managers have, for years, engaged in a campaign to throw away perfectly good books bought by public money, this could mean a severe depletion of stock, especially of books with less mass-market appeal. Library managers at the meeting were told to cascade this information to their staff. So library assistants will or will not have learned about it depending on whether or not their managers attended the meeting, and whether or not they have shared a shift with their library manager. Senior managers have also started touring community libraries to talk individually with library assistants. Cuts will be implemented before April. It had previously been known that, later this year, Carlton Road library will join Top Valley, Bestwood, Wilford and Beechdale in being shut. Senior management will not guarantee the existence of any library, and expect to make further cuts beyond those described, in the future. Also of concern is the introduction of charging for computer usage in libraries, which, of course, will hit the poorest (including asylum seekers trying to keep in touch with families or support their cases) hardest. But all is not gloom. According to reports, Loxley House (the new City Council admin HQ) was this year treated to a christmas tree costing £5,000. To get involved with Notts SOS and fight for our libraries and other services: come to our conference on Saturday 15th January. A campaign has been launched against cuts at Beeston & Inham Nook Libraries and for a good local library service for all. There will be a stall and leafleting of Beeston High Rd (outside Boots the Chemist) on Saturday 15th Jan (10.30 am – 12pm). There will also be a leafleting of Beeston West, Beeston North and Beeston Central on Sunday 16th Jan. 10.30am. Volunteers welcome and please get in touch by email or mobile (07710 903 483) if you’d like to be involved. And in the City …. This is in the addition to the established campaign, which relates to County Libraries (book budget cut by 75%!). 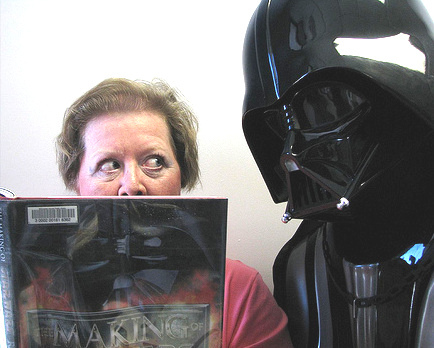 National link: Voices for the Library.